Save Time & Money With Phone Screen Interview Before In-Person Interview. In a phone screen, an employer interviews potential employees who appear qualified for the advertised job after the resume and cover letter are reviewed. The meetings, by phone, are conducted by one person, usually the hiring manager or a Human Resources staff member, who ask the same questions of each candidate they call. 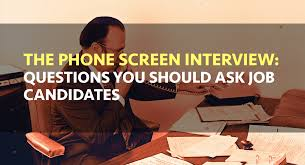 The phone screen allows the employer to determine if the candidate's qualifications, experience, workplace preferences, and salary needs are congruent with the position and organization. The phone screen saves managerial time (and in organizations that use a hiring team to interview prospective employees–staff time) and eliminates unlikely candidates. While I recommend developing customized phone screen questions for each position, these phone screen best practices will guide you. You want to ask enough questions during the phone screen to determine if the person is a viable candidate. Remember, you have already screened many resumes and applications to come up with your short list of applicants eligible for a phone screen. The applicants you phone screen should be your best prospects at this point in your recruitment process. Interested in what you should be able to expect from the candidate during the phone screen? See my recommended phone screen questions. Describe your educational background and experience. Not to limit you or commit you to a certain dollar figure, but what’s the minimum salary you’d consider right now to accept another position? If the candidate's responses to these questions satisfy the phone interviewer, proceed with the interview. If not, tell the candidate that you have other candidates who appear to have credentials and experience that more closely match the expectations of the position. End the phone interview with a thank you for taking the time to apply. What size was the organization where you last worked in terms of revenue and employees? What were the organization’s primary products and markets? If the person had reporting staff, how many people reported to you directly – what were their titles? If the candidate is not currently working, why and when did you leave your most recent position? How have you spent your time since you left your most recent position? How did your most recent position support the accomplishment of the mission of your organization? In your previous position, what do you consider to be your greatest accomplishment(s)? What were your most significant failures? How would your supervisor and coworkers describe your work? If currently employed, what would need to change at your current position for you to continue to work there? Describe your preferred work environment. Describe the management style you exhibit and prefer. What must exist in your workplace for you to be motivated and happy?